Sober Look: Today's jobs report: a wake-up call or an aberration? Today's jobs report: a wake-up call or an aberration? 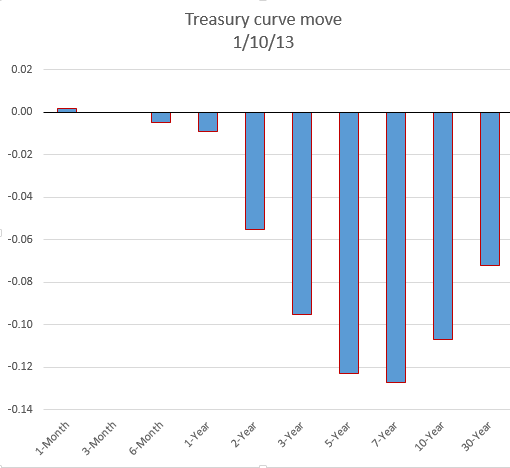 Today's payrolls shocker (see story) sent treasury yields sharply lower. As discussed last month (see post), speculative investors have piled into the market and were forced to cover their shorts after the jobs report. Going forward, until there is more visibility on the labor markets, investors will be more cautious shorting treasuries. The shape of the treasury curve move has become fairly predictable, with the "belly" experiencing the largest moves (see post). Now comes the debate on whether this jobs report was a fluke. LA Times: - Analysts were shocked by Friday's Labor Department report that the economy added just 74,000 net new jobs in December, about one-third what many had forecast. The bad weather in parts of the country last month apparently played a role, and there were unusually big payroll drops in the movie industry and at accounting firms. Still, that doesn't fully explain why the hiring was so weak. The healthcare sector was flat, as was transportation and warehousing, for example. On the whole, job growth was not only the lowest in almost three years, it was incongruous with the latest string of positive economic data -- on exports, homebuilding, consumer spending -- indicating an economy and job market gathering steam. Is this a wake-up call on more weakness in the US labor markets or simply an aberration? Thoughts, comments?